It a wittle bitty Wightning Ewementoh! How cute! For 1 mana, this little guy isn't bad. But in a time when card economy is important, you can see why Ball Lightning is so much better. This might fly in a burn or Sligh deck, though. This might be fine in a casual burn deck, especially if you're trying to save money. Throw it in with Lightning Bolt, Shock, Lightning Elemental, Lava Axe, etc., and you'll have a pretty fun all common casual burn deck. Sparky might be damn fun in FD FD FD draft. Since it's common, you might be able to scoop up an army of them (in limited, you are allowed to play more than 4 of a card. A mini-Ball Lightning. You only get half the damage in, but it only costs you one third the mana. I see this getting a lot of play in both types of constructed, as it is fast enough to satisfy the fast red decks in competitive, and yet can pull its weight in casual too. It won't see as much play in casual, but it will see some. In limited, this is crap if you don't play it by turn 2. 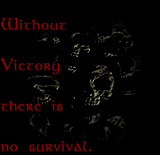 So, its usefulness is severly diminished, almost to the point of making it unplayable. Lightning Bolt is back, well sort of. This card has the potential to do 3 damage for R, but its more like “what is lightning bolt worked like diabolic edict, where your opponent got to choose where the damage went.” This makes the card significantly less good as a whole, but still an excellent new tool for the Red Burn/Speed decks. I foresee a pretty good future for this card in some decks, and thing it’s a pretty neat idea. Literally the Lightning Bolt on legs. If a burn deck manages to make its way into constructed, this guy could be one of the highlights in it. With Skullclamp, you can at least hope to get some additional cards after he runs into your opponent’s face. If the ‘clamp gets the ban, then we’re looking at red burns decks as a whole new archetype, able to put a severe hurting on opponents in a pretty short order. I don’t see this having a lot of fun in group games and stuff like that. Ball Lightning doesn’t really make his way into those games, and the smaller version of that old gem doesn’t bring anything better to the table for fun games. While, he’s fast, I don’t think that a card that drops off the board right away doesn’t give you much in way of solid resources. Late game, he’s going to be pretty close to garbage, since everything in the world blocks him; early game, randomly throwing away a card for three damage is one of my favorite things to see an opponent do. Burn decks have started showing up again lately. If they stay prevalent, then you could expect to see this card getting played. It seems like a neat card for casual players too. Limited players will play this card as a way to bust through a few more damage in a near standoff situation during combat. formats. In limited, I can't think of a time when I wouldn't like this card. on whether three damage is enough reason to invest in this card. When you really need your 12th-16th bolt in a deck, I guess. ...And a good clamp target, though everything is a good clamp target. This is -not- ball lightning. Chapman I think the idea for Spark Elemental is cute - a mini-Ball Lightning. Ball lightning was decent because of the decent amount of damage it could deal, effectively more damage than spells of similar cost. 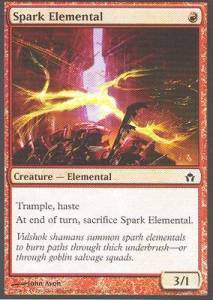 Spark Elemental can produce as much damage as 1 cost spells but the smaller front side makes it less likely for some damage to go through. Even so, it is a fast aggressive card that will probably see some play. I don't like the fact that you only get one shot, creatures are great because they swing turn after turn.